Switching things up compared to recent years, 2019 Topps WWE Raw sees the flagship wrestling set split up. 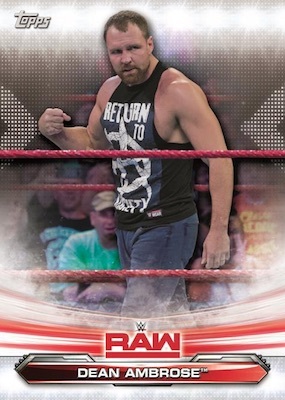 So, instead of the main Topps WWE release, such as the 2018 set, collectors now get 2019 Topps WWE Raw, followed, presumably, by 2019 Topps WWE SmackDown Live later in the year. Another difference is that Hobby case sizes drop from 12 to eight boxes. Hobby boxes still include two hits with at least one being an autograph. However, outside of this big change, wrestling fans should find the product very familiar. 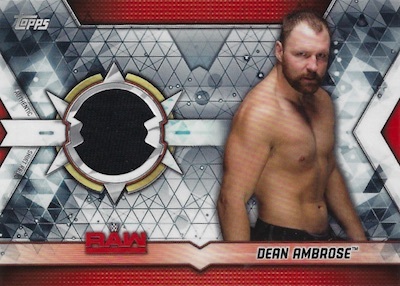 The 2019 Topps WWE Raw checklist features 90 cards in the base set, including the full Men's and Women's Raw roster, plus the Cruiserweight Division from 205 Live. Parallels consist of Blue (#/99), Silver (#/25 - Hobby only), Gold (#/10), Black (1/1), and Printing Plates (1/1). Moving to the inserts, which all combine to average two per pack, Hometown Heroes is a 48-card set that highlights the point of origin for WWE Superstars. Locations include US states, Canadian provinces and various countries. Celebrating the biggest names, Legends of Raw takes an all-time look at Raw, honoring 20 of the very best with cards that borrow the base design. There is also the Ronda Rousey Spotlight continuation insert. 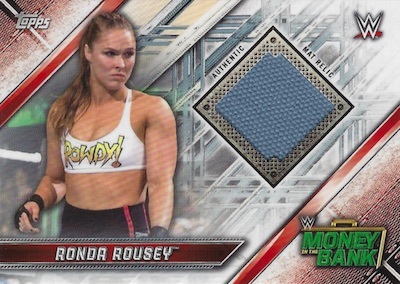 This set features the second batch of cards for Rousey, building on the initial release in 2019 Road to WrestleMania. Another thing that has not changed, the hits again center on autographs, relics and kiss cards. The main Autograph line showcases the base design with print runs of 99 copies. Limited parallels include Blue (#/50), Silver (#/25 - Hobby only), Gold (#/10), and Black (1/1). Rare Triple Autograph cards (#/10) add one-of-one Black parallels. Relics work in three options for the rebranded set, with Mat Relics (#/199), Shirt Relics (#/199) and Commemorative Raw Championship Relics (#/299). Each relic set has Bronze (#/99), Blue (#/50), Silver (#/25), Gold (#/10), and Black (1/1) parallels, as well as Autograph versions (#/10). Sending collectors off with a parting kiss, the staple Kiss Cards lineup offers Silver (#/25), Gold (#/10) and Black (1/1) editions. The lip-stained cards also come in Autograph form, with additional Gold (#/10) and Black (1/1) parallels. Buy WWE Boxes Direct from Topps. PARALLEL CARDS: Bronze (Retail), Blue #/99, Silver #/25 (Hobby), Gold #/10, Black 1/1, Printing Plates 1/1. 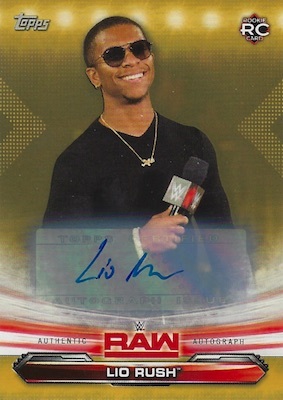 Buy 2019 Topps WWE Raw autographs on eBay. PARALLEL CARDS: Blue #/50, Silver #/25 (Hobby), Gold #/10, Black 1/1. PARALLEL CARDS: Bronze #/99, Blue #/50, Silver #/25, Gold #/10, Black 1/1. PARALLEL CARDS: Silver #/25, Gold #/10, Black 1/1. 26 cards. Serial numbered #/299. (1) 2019 TOPPS WWE RAW HOBBY EDITION FACTORY SEALED BOX-2 HITS!! !